ATV Front Basket, universal fit, heavy duty 3/4" square steel tubing and steel mesh, powder coat finish, new. 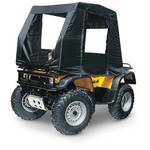 ATV Cabin Encloser, steel tube frame, powder coat finish, UV-resistant ProtekX fabric, polyurethane backing, large windows, zip closure doors, easy install, file photo, new. 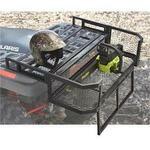 Universal ATV Rear Drop Basket, rear gate drops down, heavy duty 3/4" square 16-gauge steel tubing with steel mesh, powder coated finish, inspected, new. ATV Front and Rear Basket Set, universal fit, heavy duty 3/4" square steel tubing and steel mesh, powder coat finish, new. Impact Implements ATV / UTV 1-point Lift System, 14 Gauge tube steel construction, mounts Impact Implement accessory at the height you want, manual crank, single pin attachment, quick and easy accessory change, fits 2" hitch receivers, inspected, new. Bad Dawg GroundHog Max ATV Disc Plow with Hitch Kit, 21" cutting width, rider's weight force disc into the ground, works with independent rear suspension or straight axle setups, graduated notched discs, inspected, new. 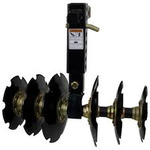 Guide Gear Disc Plow, two sets of four discs, fixed angle, 54" cutting width, axle with four heavy duty roller bearings, 2" back side receiver, accepts weight trays, inspected, new. 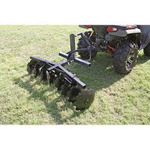 Field Tuff Heavy Duty Drag Harrow, 4' x 4', 1/2" thick harrow teeth, tows behind ATVs, UTVs, and utility tractors, can be flipped, inspected, new.